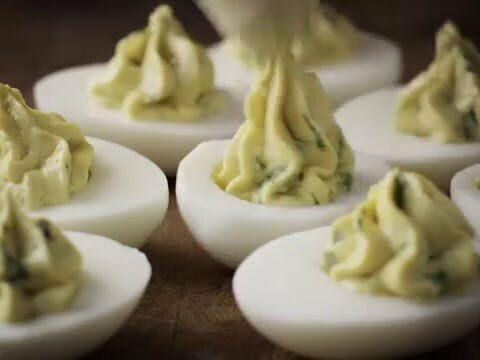 These deviled eggs are a taste of heaven – our recipe for Deviled eggs with Blue Cheese and spinach salad will lift your yolks to new heights. Spicy Dijon mustard, deep umami flavours from the Worcestershire Sauce, acidic vinegar and intense, creamy blue cheese - that’s how you improve on an egg. 1. Hard-boil the eggs for 10 minutes. 2. Pour cold water over the eggs and peel them. 3. Halve the hard-boiled eggs lengthwise and carefully remove the yolks. 4. Mash the yolks in a bowl with a fork. Add mayonnaise, Dijon mustard, Worcester sauce, pale vinegar, Castello Creamy Blue and chopped parsley and stir until combined. 6. Fill the eggs with the filling using a spoon or a piping bag. 7. Arrange the eggs on a bed of baby spinach, sprinkled with pomegranate seeds and drizzled with balsamic vinegar glaze.